Kurt Vogel Russell is an American actor. His first acting roles were as a child in television series, including a lead role in the Western series The Travels of Jaimie McPheeters. In the 1970s, he signed a ten-year contract with the Walt Disney Company, where he became, according to Robert Osborne, the "studio's top star of the '70s". In 1979, Russell was nominated for an Emmy Award for the made-for-television film Elvis. In 1983, he was nominated for a Golden Globe Award for Best Performance by an Actor in a Supporting Role in a Motion Picture for his performance opposite Meryl Streep in the 1984 film, Silkwood. 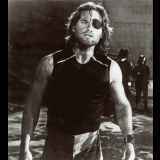 During the 1980s, Russell was cast in several films by director John Carpenter, including anti-hero roles such as former army hero-turned robber Snake Plissken in the futuristic action film Escape from New York and its sequel, Escape from L.A., Antarctic helicopter pilot R.J. MacReady in the horror film The Thing, and truck driver Jack Burton in the dark kung-fu comedy/action film Big Trouble in Little China, all of which have since become cult films. In 1994, Russell had a starring role in the military science fiction film Stargate.